The first developer release of iOS 7 has arrived and is now available to download. 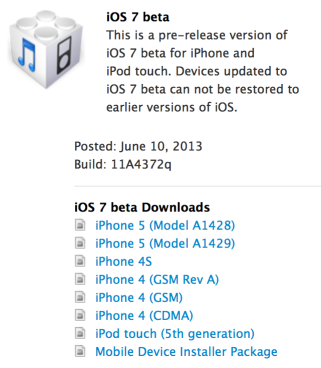 iOS 7 beta 1 has a build number of 11A4372q, and can be installed onto any compatible iOS device, including iPhone 4, 4S, 5 and newer, iPad mini, and iPod touch 5th gen. Currently, iOS 7 beta does not yet support any iPad model, but that is expected to change in the coming weeks as Apple continues to create new image assets for the major interface overhaul for the larger screened iPad, which it will be compatible with for nearly all versions post 1st gen. It is highly recommended to back up any devices with iCloud or iTunes before installing iOS 7, then once finished with the installation you can restore from the backup that was created beforehand. Initial reports are that that iOS 7 beta 1 is certainly usable, though there are some quirks and bugs which is to be expected with a beta release. These are hosted directly by Apple as DMG files. A developer login is required. 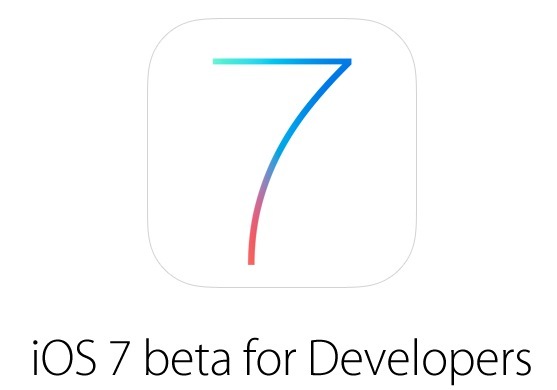 Only those registered with Apple’s developer programs are eligible to download the iOS 7 beta IPSW files. As usual, Apple cautions “Unauthorized distribution or disclosure of Apple Confidential Information is prohibited.” Developers (and the curious) who would like to try out iOS 7 themselves, but who are not yet part of the official DevCenter program, can register with Apple here and pay a $99 yearly fee to gain access to the beta releases of iOS and OS X software.